Just recently, world renowned supermodel Kate Upton delivered a message to her fans that rocked them to their cores, as they had not seen it coming. To truly get a sense of just how meaningful what she announced was, however, we have to back up a little bit. It’s time to delve into this model’s past – her bumpy, uncertain, and unlikely road to fame – before we get to her very happy present and incredible transformation. As with all good stories, this one too starts with overcoming the doubters and naysayers. Born in St. Joseph, Michigan in 1992, Upton moved to Florida when she was seven. Considering her stature today, you’d probably assume she was the most popular kid in class. She wasn’t. Far from it, in fact – she was bullied for her long legs and bushy eyebrows. Before walking on runways worldwide and gracing countless magazines’ covers, Upton excelled in a different field – competitive horseback riding, known as equestrianism. In fact, she competed in tournaments and even notched several major wins. After being scouted in a Miami casting call, Upton was signed to a modeling contract the very same day and got her first big break in the business at 19, appearing in the 2011 Sports Illustrated Swimsuit Issue, in the body paint section. The magazine also named her Rookie of the Year, which was a nice touch. Upton received the honor again the following year, gracing the cover of the 2012 issue, and sent her career skyrocketing to the stratosphere. With a Sports Illustrated cover under her belt, Upton was already riding high, but something completely unrelated to modeling would make her a household name – dancing. In fact, she had not one but two videos of her boogying go extremely viral. The first was in 2011, when a friend recorded her dancing the Dougie at a Los Angeles Clippers basketball game. The second was taken in 2012 at a fashion shoot with photographer Terry Richardson. During a break in shooting, Upton performed the Cat Daddy dance, and broke the internet. Undeterred by critics who tried tearing her down, Upton continued doing work for various swimwear brands. However, she had other dreams: becoming a runway fashion model in the vein of Cindy Crawford and Gisele Bündchen. With her curvy figure, however – which was extremely different than the leaner look most models sport – she had trouble breaking through and snagging a big fashion campaign. She was told to lose weight, and she tried to at first, but soon realized that was simply the shape of her body, and grew to accept it. She continued working an extremely busy schedule, with perhaps her most memorable early cover coming in 2013’s Sports Illustrated Swimsuit Issue, which whisked her off to the coldest place on Earth – Antarctica. What was it like working in such an environment? “I’m from Florida, so it wasn’t great for me,” she said with a smile. It took her two days just to get there, and when she did she sort of wished she hadn’t; it was so cold her body started shutting down, and she was losing eyesight and hearing. Despite all her success and publicity, Upton has somehow maintained a relatively clean image, free of the usual Hollywood drama. Except for one thing, that is. In 2013, she landed another cover – this time for Vanity Fair – in which she greatly resembled screen legend Marilyn Monroe. 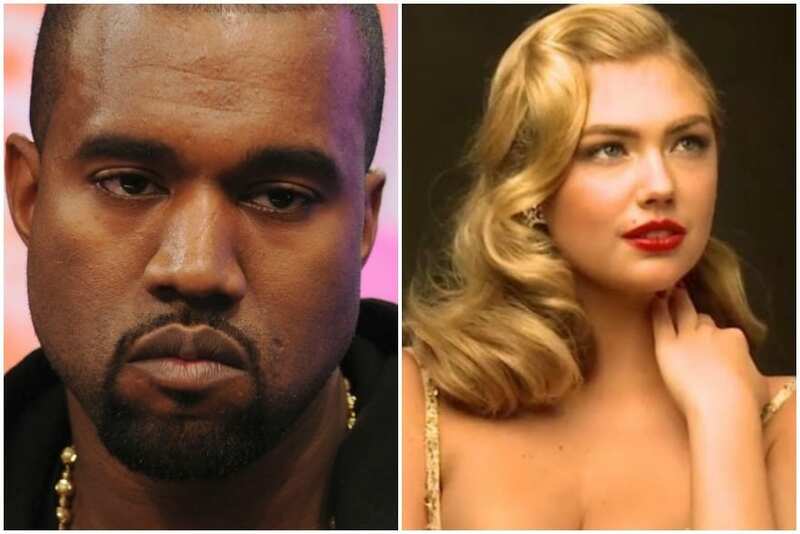 Yeezy, as he does, took offense, and said that despite all the trouble they gave him, he loved the paparazzi because they empowered him, unlike Vanity Fair, which tried to say that Upton is like Monroe. Kim, he contested, was like Marilyn Monroe, as they’re both controversial. 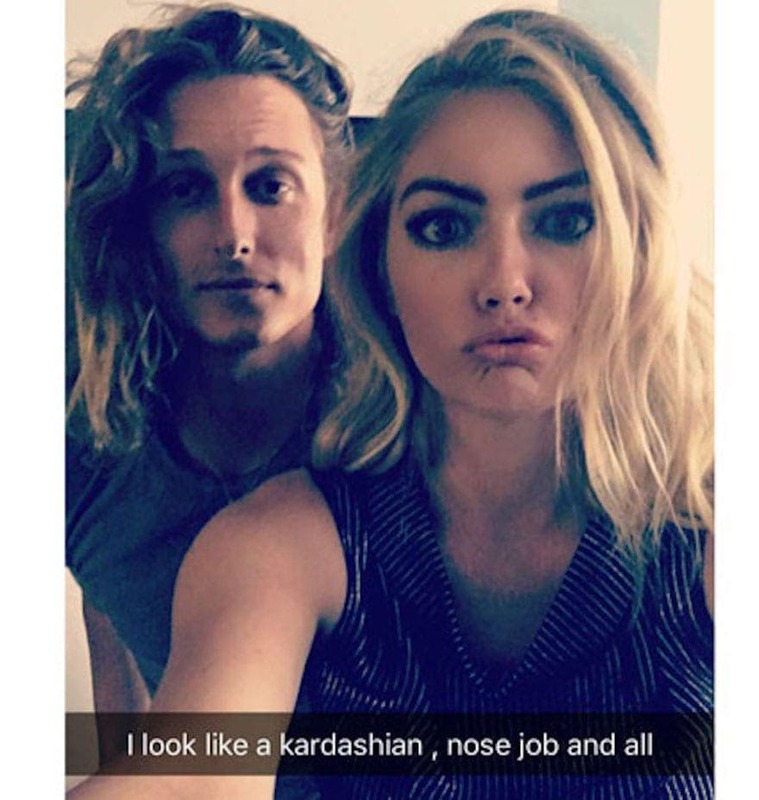 It’s often said that revenge is a dish best served cold, and Upton must’ve been listening, because three years whole later, she uploaded a selfie to Snapchat in which she made the “duck face” lip pout that Kim made so famous. That could’ve been an innocent, playful move on her part. So just to eliminate any confusion, she added the caption, “I look like a Kardashian, nose job and all.” Those are officially shots fired, as Kim has vehemently – and repeatedly – denied years’ long rumors that she’s had work done. We’ve already said that Kate never exactly had that classic model physique, and over the years, that has rubbed certain people the wrong way. One self-proclaimed “pro-skinny” website called her “lazy,” “lardy,” and “fat” for not being a size zero like most models. People in the fashion industry have told Upton to lose weight, in her own words, “all the time.” She worked out, certainly, but soon realized that instead of exercising for industry executives, there’s someone else she’d much rather do it for – herself. 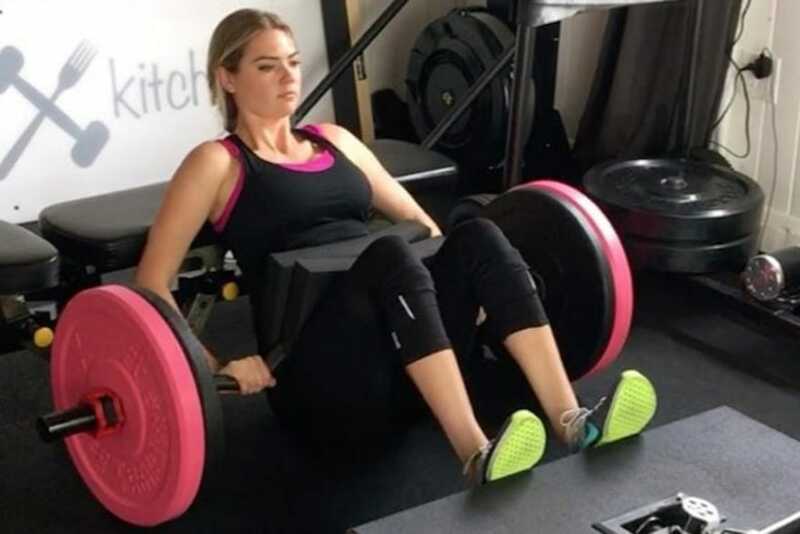 In her quest to transform herself, Upton used the services of Los Angeles-based personal trainer Ben Bruno, who also helped whip celebs like Chelsea Handler into shape. Bruno told the media Upton is a “total bad*** in the gym,” adding her workouts were not for the faint of heart. And he wasn’t kidding – she reportedly trains five to six days a week for at least an hour each time. Working out has helped her build up her strength, and Bruno says she’s actually stronger than some athletes he’s worked with! Since he’s personal trainer to both, Bruno divulged that a friendly gym rivalry has developed between Upton and Chelsea Handler. 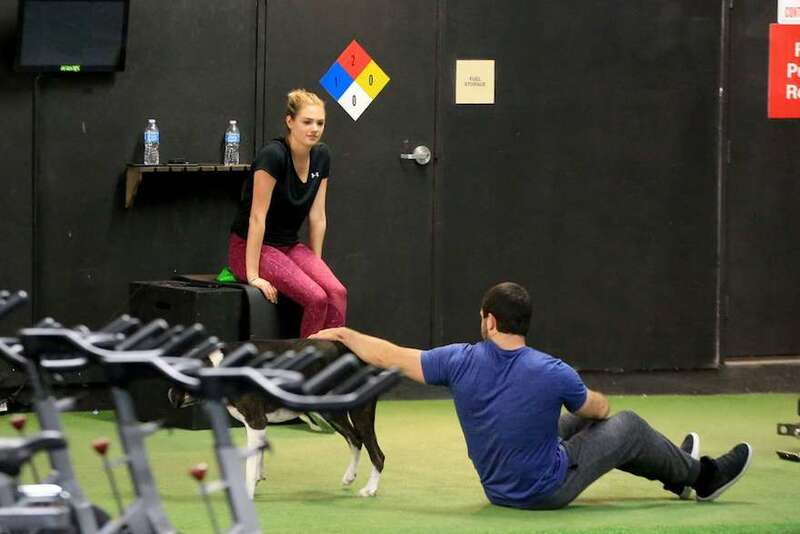 Handler, according to Bruno, is a “a maniac on the sleds,” and the two try to outpace each other at his gym – each trying to break the other’s records. In fact, Upton often tags Handler in Instagram videos from the gym, just to rub her nose in the action – all in good fun, of course. But it isn’t strictly about working out, as diet plays a crucial role as well. Clearly, exercising isn’t enough to sustain such a substantial transformation as Upton’s. She needed to change her eating habits as well, getting rid of all processed foods and sugars, replacing them with lean proteins prepared specially by a chef. Maintaining a strict diet can be hard, and everyone knows you need “cheat days” to let off some steam, and although Kate doesn’t get any cheat days – she knows when it’s okay to let loose and indulge. In one instance, she uploaded a video of herself pulling weights while munching on a donut. 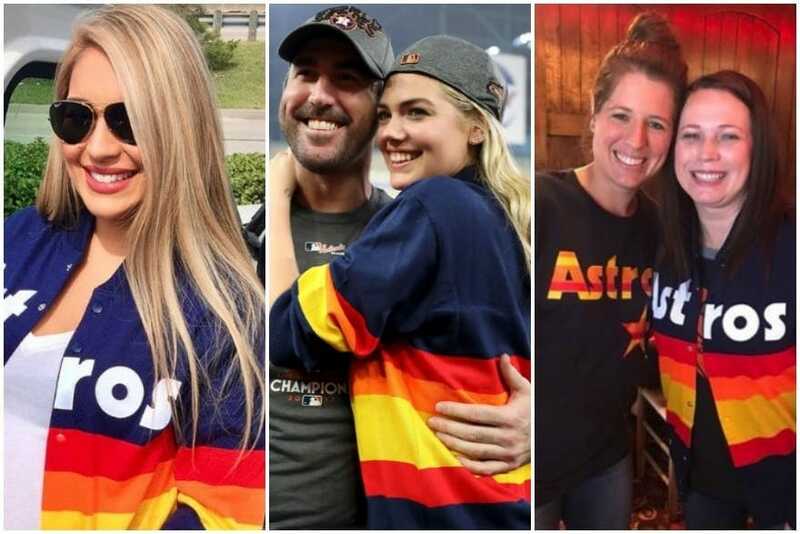 In early 2014, Upton started dating Houston Astros pitcher Justin Verlander. He was the second celebrity she was linked to, after briefly dating 14-season Dancing with the Stars veteran dancer Maksim Chmerkovskiy. 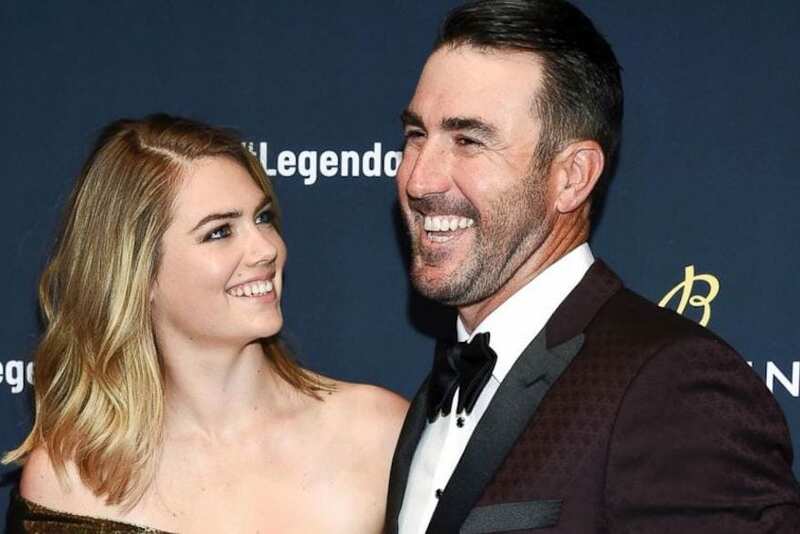 Upton and Verlander met while filming commercials for a Major League Baseball video game, and fell in love. At the time, the 7-time All-Star, Cy Young Award winner and former Most Valuable Player was playing for the Detroit Tigers of Upton’s home state of Michigan. They’re both rich and famous, but does that mean it’s always been smooth sailing for the pair? Just a few months ago, Verlander opened up about how Upton saved him from depression. As he was trying to cope with injuries and the rigors of a pro athlete’s life, she was the only one he could talk to, and they staved off dark moods by playing board games. Two years after they began dating, Justin proposed to Kate and asked her to be his wife. 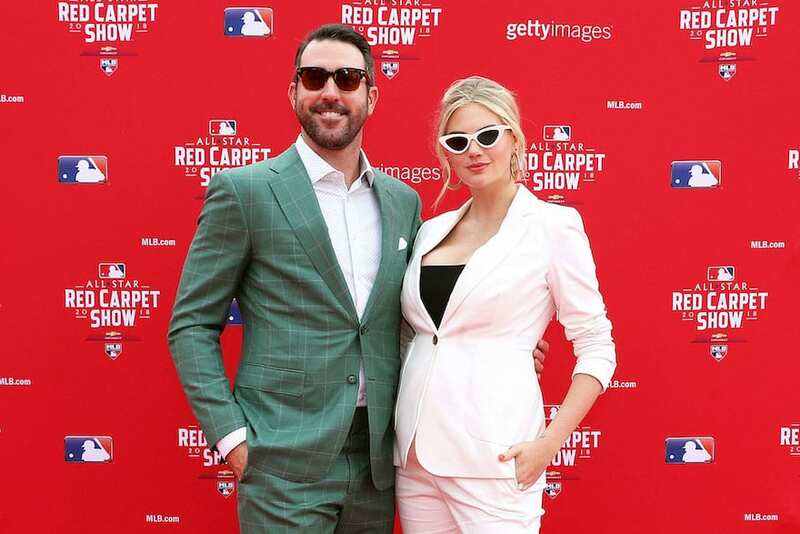 Verlander proposed just before the beginning of the 2016 baseball season, but the couple didn’t come out with the news publically until the famed Met Gala that year, when Upton showed off her engagement ring at the annual fundraising event for the Metropolitan Museum of Art’s Costume Institute in New York City. A jewelry expert evaluated the ring as an 8-carat diamond worth about $1.5 million. Talk about bling! On September 1, 2017, after 12 years in Detroit, Verlander was traded to the Houston Astros minutes before the trade deadline. It was something he’d have a hard time accepting, but Upton would help him immensely, as he himself later said. In a situation that was pure poetic justice, he led his new team to winning the World Series title at the end of that season – and shared a kiss with Upton on the field right after. The title-clinching final game in that World Series was played November 1, 2017. 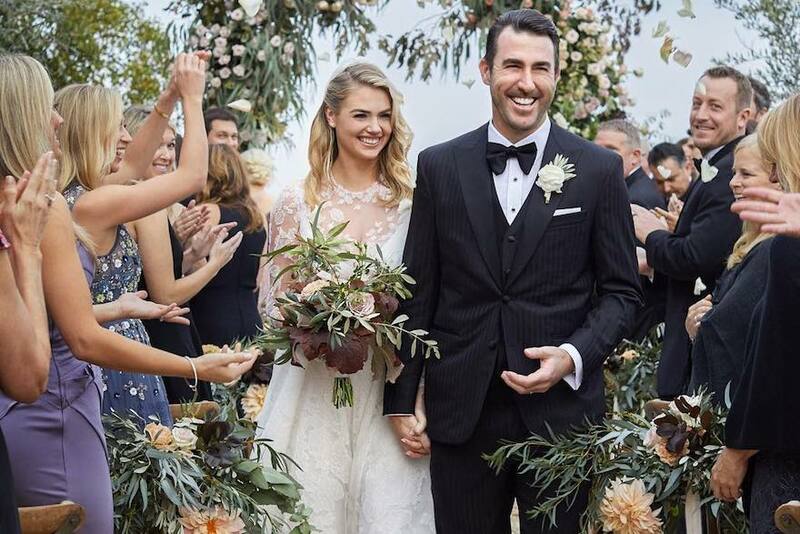 Three days later, on November 4, Verlander married Upton in a medieval church rising above the Montalcino valley in Tuscany, Italy. He sadly missed the traditional post-championship parade, but probably wasn’t too broken up about it. Actually, they both almost missed something – the wedding itself. When they set the date, they had no idea the World Series would go to seven games, and all their guests had already left for Italy, but all’s well that ended well. Considering they’re just so darn perfect together, and both are so incredibly successful in their own respective fields, it’s really intriguing to get a fly-on-the-wall perspective on what would constitute the perfect date for Kate and Justin. Apart from date nights, Kate also has her own methods of unwinding and taking the edge off. She was willing to let her fans in on the secret as well, saying that what she’s feeling high strung, she tries to work up a good sweat, which helps her with both resetting and burning off some of those nerves. As someone who has made an international name for herself based not just on her looks but also on her style and poise, it’s almost surprising to find out even Kate has off days. “I try not to beat myself up,” she said, explaining that everyone has days where they don’t feel their best. Instead, she focuses on recapturing that confidence by taking care of herself – anything from eating healthier to working out – and that healthy lifestyle helps her get back to where she wants to be confidence-wise. Another thing that undoubtedly helps Upton unwind – as it does for us all – is indulging in a guilty pleasure or two. As with most anything else about her, this supermodel’s guilty pleasures are surprisingly down-to-earth. When asked what her guilty pleasure was, she had some trouble choosing just one, actually. Definitely on the list, though? Online shopping, watching an episode or two of The Real Housewives or dining on wine and French fries – though not together, we hope! Shooting back, Upton said that just because she had an opinion on the aforementioned call doesn’t give anyone the right to be degrading or disrespectful to her simply because she happens to be a woman. After an all-important Houston Astros win in the seventh game of the American League Championship Series, Upton took to the field to embrace her fiancé. While we all awwed at their #couplesgoals, others were concentrating more on the sweater she was sporting. The retro style early-1980s Astros piece was not really readily available – nor was it particularly popular among the general public – until Upton was seen wearing it, that is, at which point it exploded and promptly sold out all over again. Eight years ago, Kate and her family found a mixed breed boxer puppy and decided to adopt it. All that time later, and the pooch – named Harley – is still by Upton’s side. The two are quite inseparable, actually, as he even accompanies her when she goes to the gym. And when she has to leave the country for work, she makes sure to keep in touch with him by using FaceTime. At this point, in fact, Harley is a bigger celebrity than many movie stars. Kate opened an Instagram page for her pooch, where she shares candid snaps from a supermodel’s life through a canine’s eyes. It seems there’s a market for that sort of thing, as Harley now has more than 16,000 followers. Not content with merely staking a claim to an online presence, Harley also took his talents to printed media, appearing alongside his owner on the cover of the Singapore edition of Harper’s Bazaar. Can his own modeling contract be too far off? Not content with merely being outstanding in one field, Upton has also dabbled in acting. She made her big screen début in 2011 comedy Tower Heist, playing a bit part, and has had two starring turns in films so far – in The Other Woman and The Layover – both comedy romps. She played what’s probably her most unexpected role in the 2011 Three Stooges movie, playing a nun! Appearing alongside her were such gals as Jane Lynch, Jennifer Hudson, and… Larry David? Man, that was a weird movie. On July 14, Upton revealed enormous news to the world – she and Justin were expecting. In a social media post showcasing her barely-there tummy, she added the hashtag “#PregnantinMiami” and tagged her husband. Her belly has since grown, and – remaining fearless – she hasn’t been shy about showing it off. As for Verlander, he really got his hopes up for late night pickle cravings, but she was forced to disappoint him, as she hasn’t had any – and she still works out. We knew this was coming, and so not long after Upton officially announced her pregnancy, hubby Justin chimed in with his own words regarding the upcoming change to their lives. “You’re going to be the most amazing mom!” he wrote, adding he couldn’t wait to start this new journey with her. “You’re the most thoughtful, loving, caring, and strong woman I’ve ever met,” he added. “I’m so proud our little one is going to be raised in this world by a woman like you.” Say it with us now: aww! We often refer to pregnant women as “glowing” and other similar adjectives, and it’s true – there’s a certain something about a pregnant woman that’s different from the way she was before; just something about her that’s a little transformed. That goes doubly for Upton, as pregnancy is a very good look on her. However, it’s not all sunshine and lollipops, and pregnancy definitely has its downsides. Asked what the one thing she wished someone had told her about being pregnant, she replied… that your backside gets pregnant too! When a couple succeeds in conceiving, it brings up any number of dilemmas for the mommy and daddy to be. Some of them have to do with the more distant future – like deciding what kind of education they’d like to give the little tyke – but some have more immediate impact. Another crucial decision is obviously finding a name for the little bundle of joy. They can’t go around living life without one, can they? Well, we’re sure a celebrity will try that with their kid eventually. Regardless, it seems the Upton-Verlander couple is somewhat indecisive on that point. “We thought of names but we’re both in denial,” Upton said with a laugh, adding that she and her husband make suggestions to each other, which the other person then promptly ignores. Upton’s a model – that’s just what she does for a living. When she became pregnant, she continued doing her day job for as long as possible, even appearing in a lingerie campaign. Sharing a snap from the shoot on social media, she revealed she felt really sick throughout her first trimester, which made it extremely hard to get through it. She later detailed her accusations against Marciano, saying he allegedly grabbed her and acted in an inappropriate manner at a past photoshoot she did for Guess. Marciano denied the allegations.